You know the song that goes: "Mama, don't let your boys grow up to be cowboys..." I hear it in my head when someone asks me how I drew something. There are so many things I could say and none of it very helpful. I was one of those kids who took the book "How to Draw Animals" out of the library several times and while I flipped through it and remember some of the drawings, I never took a lesson from it. I had to learn it myself. But if I was going to give a word of advice, I'd say, think about what you're going to draw, imagine it, see it as clearly as you can and then start drawing what you imagine. Which is exactly what I didn't do with this one, nor many of the other things I've drawn! I started with the bridge. I thought about a weird organic bridge, perhaps a human made metal one totally overgrown by vegetation and climbing vines and then I thought it could be made of growing trees and vines and then started drawing. I did a really loose blue pencil drawing and then inked it. If seen from above the bridge might be an "s" curve, but what it crosses or why... I don't know! It's like there's a bridge there because there's a bridge there and bridges are interesting. I like the "Art Nouveau" look of it. I liked the arching shape of the bridge and how it suggested the top of a number eight (8) or one side of a mobius strip and I wanted to reflect that shape on the lower side of the page. With my blue pencil I drew and oval and somehow the oval became a crab. 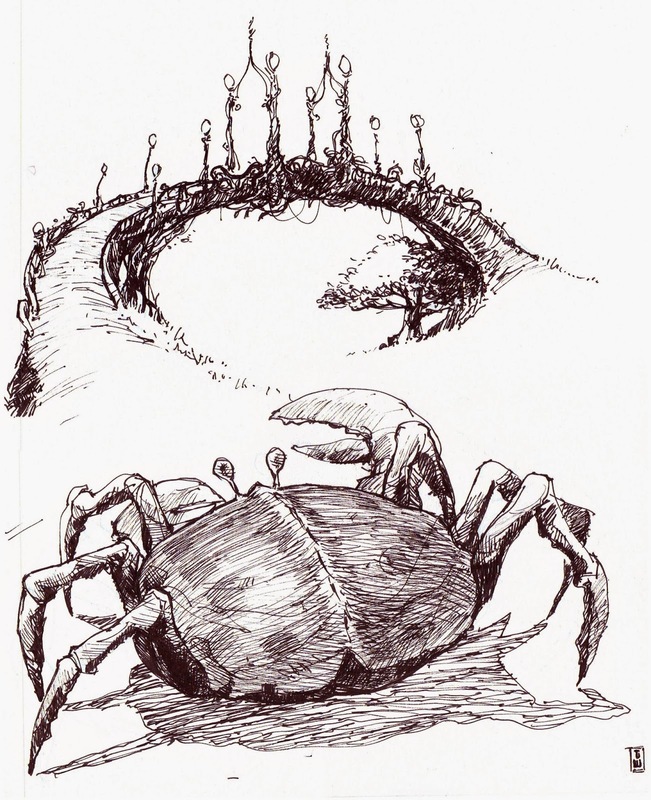 I think the rendering of the crab is what makes it; I need to thank the marker for that! Holding it very lightly, and doing a lot of very light strokes I was able to shade it up pretty nicely. So there you go, dig deep into your psyche, pull out something that really stirs you, think hard about what you're going to draw, imagine it as clearly as you can... or just let your pencil do what it does and see what you get! I signed out those books, too -- and I never took a single lesson from them, either. I like where your pencil took you. My favourite part? The far right of the underside of the bridge. There's a central vein or crease, which gives the underside a nice shape. Screw planning! And screw the Cintiq -- your inking is fabulous! Thanks! Yeah, the three-dimensionality of the underside of the bridge was fun, I like that aspect too. I could see that was a nice part when I was doing the rough drawing. Funny thing is the signature. I did it upside down because it was way over on the right side of the sketchbook and I knew my hand control wouldn't be very good. It's hard to get a "J" the right way 'round from upside down. I'll not tell anybody about your waning skills of observation!